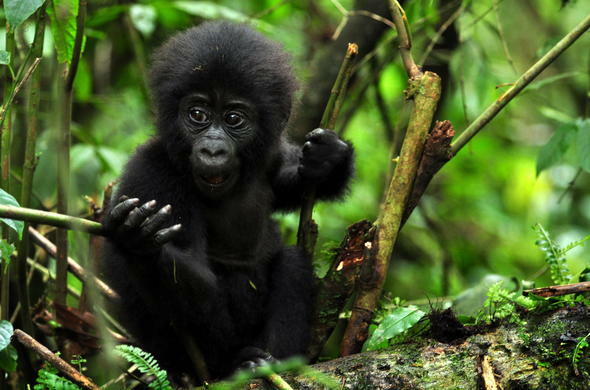 Go on thrilling gorilla tracking adventures in this 4 day Bwindi Impenetrable National Park Gorilla Trek in Uganda. 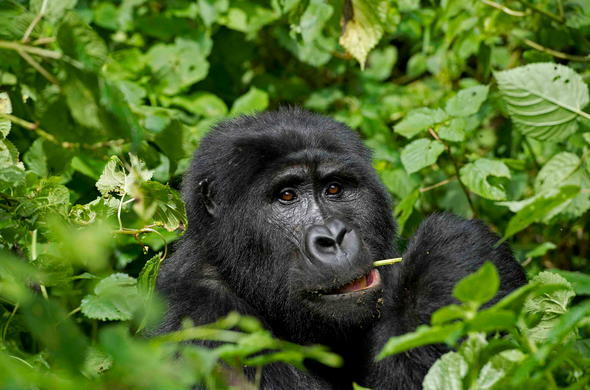 Escape to Bwindi National Park which is part of Bwindi Impenetrable Forest, for a 4 day African gorilla safari that will surpass your wildest imagination. Slumber at an UNESCO World Heritage Site, amongst wild beasts and small bush roamers. Enjoy bush breakfasts, gourmet lunches and dinners whilst you enjoy the exquisite views of the rainforest. 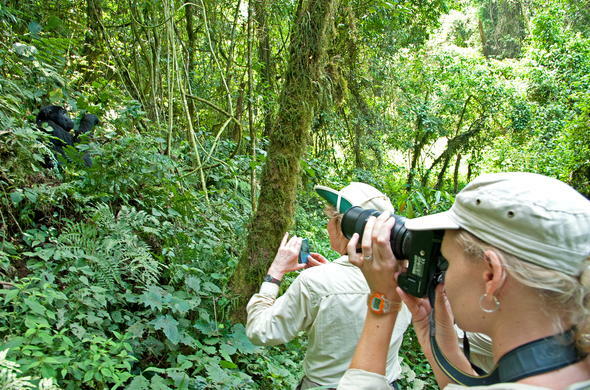 Spend the day tracking wild mountain gorillas with a professional guide. Discover the secret hideouts of these magnificent beasts and feel the thrill as you come into close encounters with them. Visit the local community to discover the rich heritage of the Batwa Tribe, and see how they go about their daily lives. Your epic Bwindi Gorilla Safari starts with a flight from Entebbe to a local airstrip inside the Bwindi Impenetrable Forest, in a light aircraft. Admire awe-inspiring vistas as the plane comes into land and during the road transfer to the camp. This region of Uganda is one of volcanoes, deep valleys, waterfalls, lakes and breathtaking mountains. Soak up the peaceful environment and relax after your travels as you prepare yourself for the adventures and memories to be made over the next few days. Take delight in an al fresco lunch, whilst seated on a raised platform overlooking the rainforest. 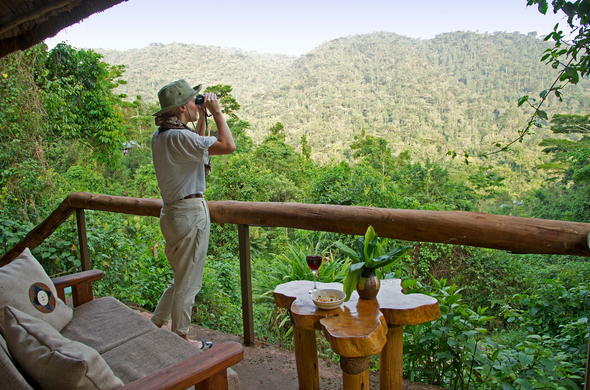 Enjoy the ambience and scenery, Bwindi is home to a diversity of bird, butterfly and monkey species that may be spotted from the lodge. A scenic early morning transfer will take you to the tracking point, where you will be briefed on the safety precautions and gorilla etiquette. Only a select few get to enjoy this experience of a lifetime. You can expect to track Mountain Gorillas in Bwindi Impenetrable Forest and learn more about these magnificent creatures for about 2 - 7 hours on the steep slopes of the dense forest. When you finally spot these rare Mountain Gorillas, you can spend up to one hour with them before making your way back to camp. On occasion the resident gorillas have been known to visit the camp, so you may be lucky enough to spot more gorilla as well as admire the stunning views from the private viewing deck. On day 3 you will spend the day interacting with the local Batwa Tribe, and learn all about their unique culture and customs. Be sure to pack your stamina, for the walk to the village is 3 hours. Spend an hour with the Batwa and experience a musical performance. 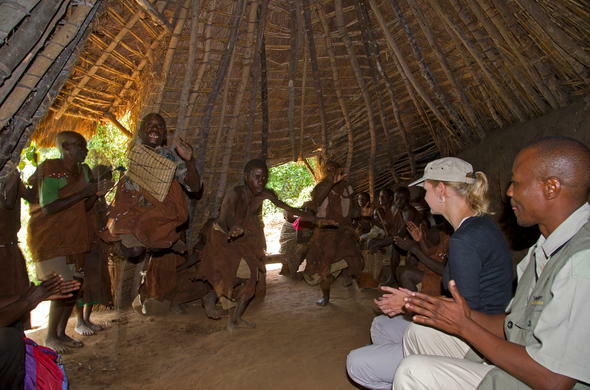 Enjoy a live hunting and gathering demonstration and an opportunity to see how this, the oldest tribe known of the Great Lakes region of Central Africa, live before setting off on a two hour hike back to camp. Once back at the camp, put your feet up and relish a well deserved drink and canapés around a roaring fire. Reflect on your impressive Gorilla safari in Uganda, over a hearty breakfast. Keep an eye open for the brilliant coloured butterflies and birds hovering in the forest. Take your final snaps of this African paradise and all its wonderful creatures before your departure from camp. A road transfer to the airstrip, meandering through the forest will take you to the light aircraft, where you will meet your onward travel arrangements.